What follows is a personal opinion, some of this includes my business model for surviving the changes in the industry, how you take this is up to you. I am more than willing to talk about the industry, and what we are doing to keep on growing. I write this as one of the new breed of comic book stores, I have no physical storefront, I do not need one, nor do I want one. I follow along the same path with other comic book stores that have closed their storefronts and have gone entirely online. I have a warehouse, I have repeat customers, and I have a following of people who prefer to shop from me because they know I will take care of them. I sell globally, about 20% of all my sales are overseas, I sell to the US Armed Forces, I sell to libraries, I sell to people all around the USA bringing them items that they cannot find in their local comic book stores. We carry things that cannot be generally found in a local comic book store, we are not space constrained because we have a warehouse, and we purchase very carefully. I don’t have to leave the isles open for customers. I don’t need pretty displays, I don’t have a lot of overhead. I cannot become a member of Comics Pro because I do not really exist as far as they are concerned, nor do the five local comic book shops that have closed their doors and gone online in the last three years in the Puget Sound area. Many of the comics’ professional organizations are pretty much closed to me because of the business model I chose. I also see little to no need for one major supplier/distributor if publishers are going direct to consumers with digital comics. I have always hated single points of failure. I see a wonderful cool comic book world opening up, and one that will require we pay better attention to the market by using online tools that tell us how well something is selling online. I see a lot of potential to clean up in this market by diversifying, and catering to collectors. We are data driven, not hope and prayer driven, we seriously watch the market, and what is selling where. 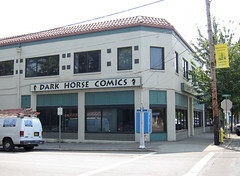 Which is why I am amused by the current ruckus about Dark Horse comics, heck they need to go digital, go, do it, but you have to do me a favor when you do. See collectors are going to want physical copies, they want paper, they want paper so that they can resell it (try reselling a digital mp3 or a digital comic book and see how fast you get sued), they can trade it, they can do anything they want to do with it. Digital is not meant for long-term keeping, it is not transferable, it is not resell able. Collectors will want the transferability and edge that comes with simple old fashioned paper. Our industry is changing; digital opens doors that would otherwise remain closed. While I respect many of the comics’ book people I meet online and in person, the world is changing, and comic book stores better get used to that. I see many comic book stores in the future changing, they will have to adopt items like toys, go to conventions, deal in only collectable items, and let the weekly comic book market die. Some might even close their physical store and go online like me. The local weekly release has been on a respirator for years, with gimmicks, resets, pauses, lines created and dropped. Costs for print have continued to go up, and three years into a brutal recession with no end in sight, publishers, artists, and others need a way to reach people directly. We are as an industry in deep danger of going the way of Tower Records and Borders. Dark Horse started a firestorm of controversy on this issue, and started a conversation we as an industry should probably be having right now. From my perspective, the online weekly serial is dead. It has been dead for a while, they sell for pennies, and anyone who thinks that a comic book store can remain open taking a loss on each sale is living in the clouds. I have seen comic book stores on Amazon and on eBay list a comic book fresh from diamond for 99 cents or less. Sorry run the numbers, you are paying Amazon to take it off your hands, and you are losing money, maybe money you could not afford to lose. It is even more amusing when the comic goes for a penny, because you are losing even more money. I am thinking yeah, I want those special collectable editions, because a sale at 14.99 is so much better than a sale at $3.99 for what I take home. $3.99 is the lowest price I can charge online for a brand new comic just released and make a couple pennies once all the postage and fees are paid. Not only do I want those limited high priced editions, I want the publishers to provide them, they would much rather get 7.50 from me (50% standard discount), Diamond would rather get their cut, more money, while the weekly people go and do their digital comics. See I want that world of limited edition high priced comics; let the masses have digital, let the collectors have awesome collectable limited edition comics and trades. Those are the things that will go at conventions, those are the things that will go online, and there is a lot more money to be made for everyone in this world. Include toys, and other marketing products from water bottles to floor stands of Iron Man and you get it. This is what I am betting my company on; this is what the niche markets are thriving in, within the digital age of books. Some of the smaller traditional bookstores are doing awesome catering to the unusual, the rare, the hard to find, the groovy, while letting digital have its way. I need Brian’s special editions to survive. Dark horse probably gets some of this; many of the smaller publishers certainly get this. Slave Labor Graphics gets this, and really smart local comic book stores are going to go this route. Those that do not, that is ok, they might find a way to survive in a limited fashion, but if you want to grow and succeed in the digital age, you will find the unique, the expensive, and the very cool. You will support publisher efforts to do this, and you will need to start building personal relationships with publishers, authors, and marketing people. This is what I am betting my comic book company on, and in the end, we might be all that is really left. Then we will be the “Comics Pros”, because we will be the last LCS standing.